This paisley scroll bar necklace in 14K yellow gold with 18 inch chain from Apples of Gold Jewelry is a perfect necklace if you are looking for something that has a vintage appeal! 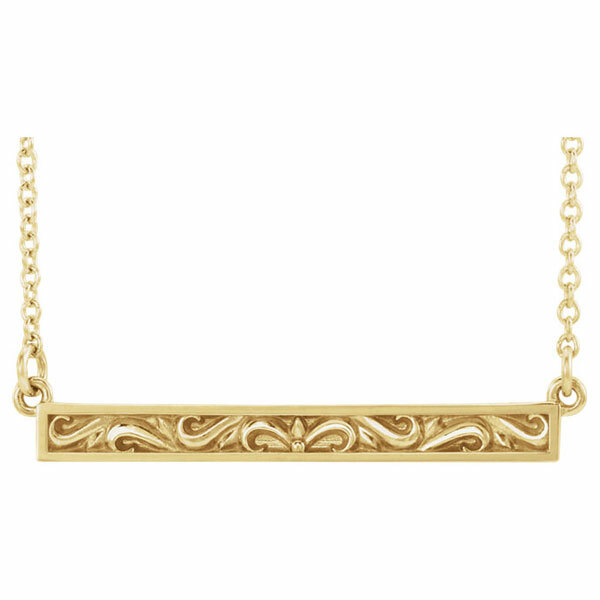 The 14K yellow gold necklace features a rectangle bar with a paisley scroll design going across the inside, with a border of plain 14K yellow gold around the outside. The pendant itself measures just under 1 1/8" wide by 3/16" tall, and has a chain that measures 18" in length. This necklace is great for a sophisticated look or for spicing up your daily wardrobe! We guarantee our Paisley Scroll Bar Necklace in 14K Yellow Gold, 18 Inches to be high quality, authentic jewelry, as described above.